I am staying in this beautiful guesthouse in Sangkhlaburi named “P Guesthouse” which also offers tours. I remember checking out there website before coming here and frowning at that offer. Now, after arriving I got my hands on one of their package tour flyers, and I was really impressed. 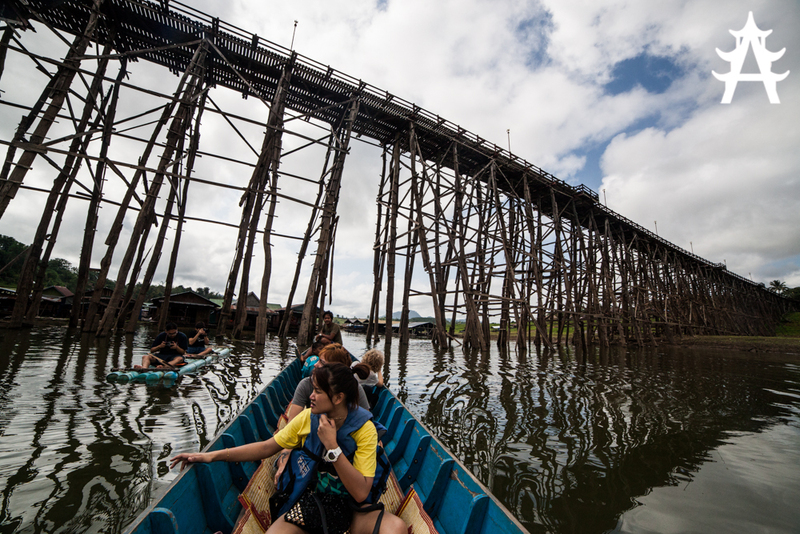 They advertised this tour including a boat cruise to the famous Mon Bridge and the sunken temple of Sangkhlaburi, a 4×4 ride into the jungle, a ride through the river and the jungle on an elephants back and a bamboo raft down the river. Now that is all good, but I am sure its incredibly overpriced, right? 1000 Baht? Including one nights stay in my guesthouse? That is not expensive at all. I mean, I wanted to stay in this place regardless, so if I deduct 125 Baht which would be the half of my room costs (its a weird calculation) the tour price is no more than 875 Baht, for a 5 hour trip. 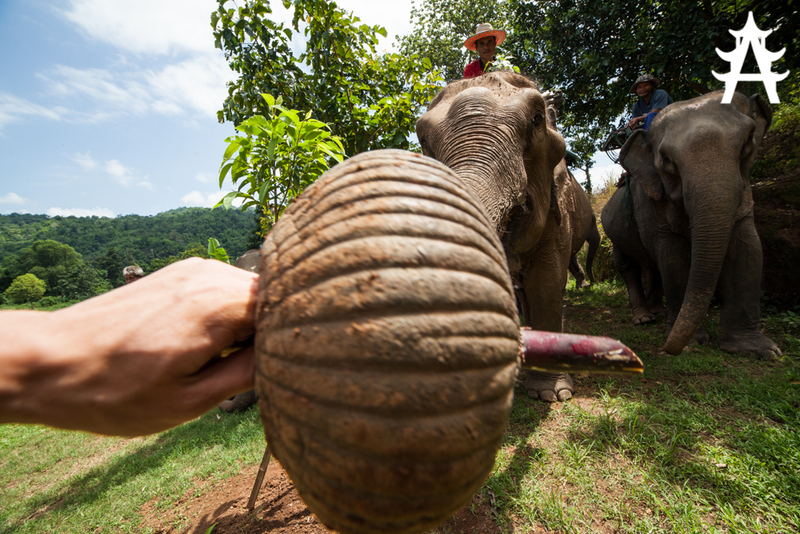 After researching this package tour online, I found out that everybody was very happy witht his tour, and also I learnt that the elephants that are included are treated well. I have seen an elephant camp when visiting Ayutthaya and I could never spent money there. The elephants get hit, they are kept on very very short chains and only get to walk in the same circles all day long. Its depressing and definitely nothing that I would like to support. But in this tour’s case, it seemed to be different, at least from what participants wrote. So I decided to give it a shot. The tour started at 9AM, we got picked up at our guesthouses shore, were given one life vest per person and were told to have a seat in the longboat. The tour led to the Mon Bridge, which was just perfect, as I was trying my best to find nice angles over the course of the past days, without luck. This perspective was just what I wanted, and the cloudy sky was on my side. 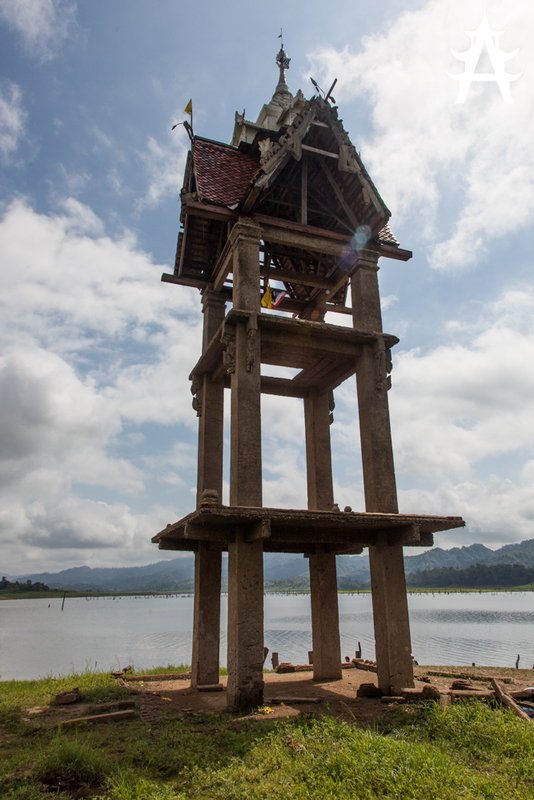 We continued to the sunken temple (Wat Saam Prasob) that I only knew from images. Promising images. In reality it was almost cooler, as we, due to the low water level, had the chance to even walk into the buildings and really explore the area first hand. 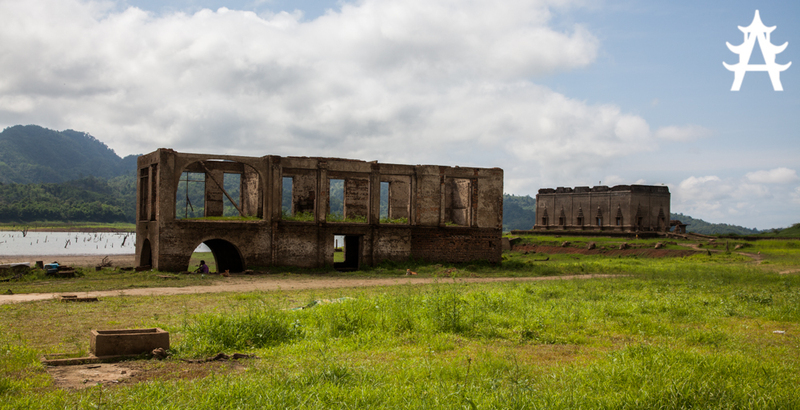 According to Wikitravel, the water level rises in the rainy season, and reaches its peak in September, when only the top 1-2m of the buildings are visible. It would definitely be interesting coming back then, to see it in flooded circumstances. After that the longboat took us to a shore, very close to Chedi Buddhakhaya where we changed our means of transport and continued inside a 4×4 truck. After leaving Sangkhlaburi we quickly got off the asphalted roads and were driving through jungle, with only very rough “pathways” that the truck had to work through using all its power. These ways led us to the highlight of the day, the Elephant place. We arrived and already saw an elephant walking through the grass, another one was passing the river and came closer and closer. After a bit of meeting each other we mounted the beautiful giants and off we went. It was shaky, and quite high, and I enjoyed every second of it. 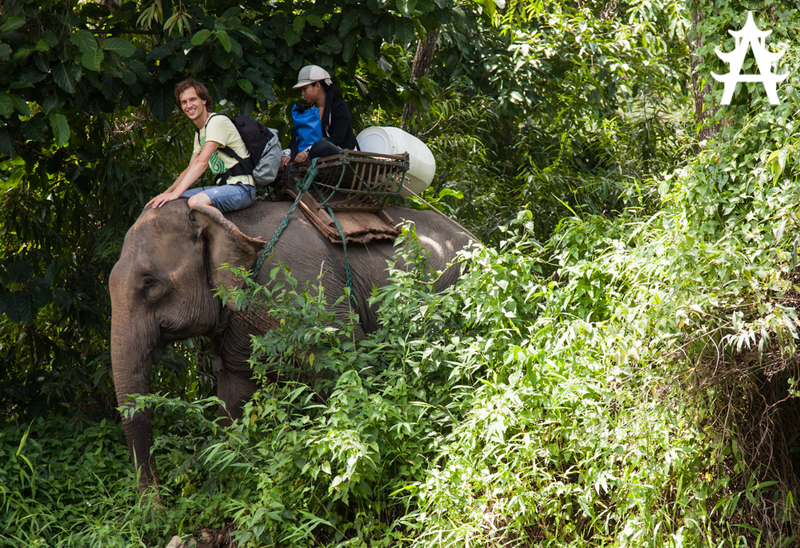 At some point our Mahout jumped off the Elephant to do…something…and I had the chance to leave the saddle and sit on the elephants neck, with me feet behind his ears. That was crazy, feeling his skin and also realizing that he would turn his head to the left when softly kicking his right ear with my feet, and vice versa. 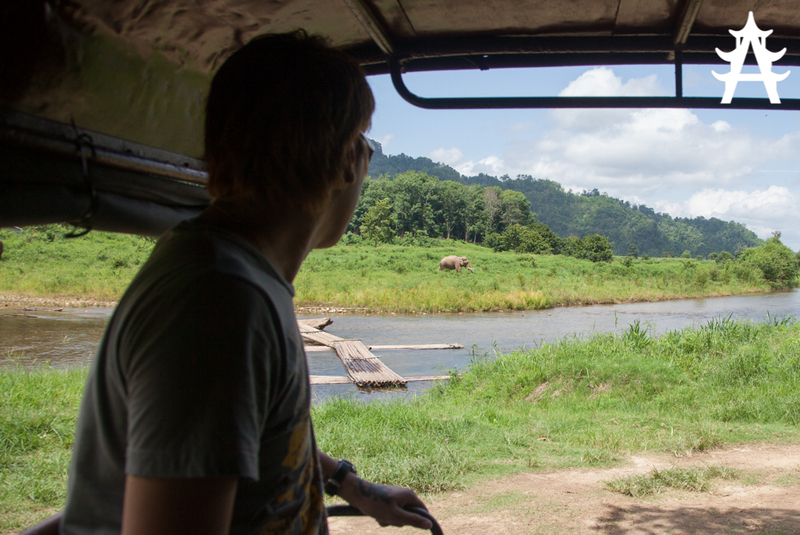 It was incredible, we crossed the river several times, and the elephants, the weather, the surrounding nature, all this together created a magical atmosphere. After a small lunch (fried rice and water) and a short hike through the river and woods, we arrived at the last destination, the bamboo rafts. After the elephants I did not really care too much about these rafts, they could hardly get more exciting. I was pretty much right, still it was a nice and settle trip down the river. The raft did not accelerate too much and so we had much more time to really take in the nature. 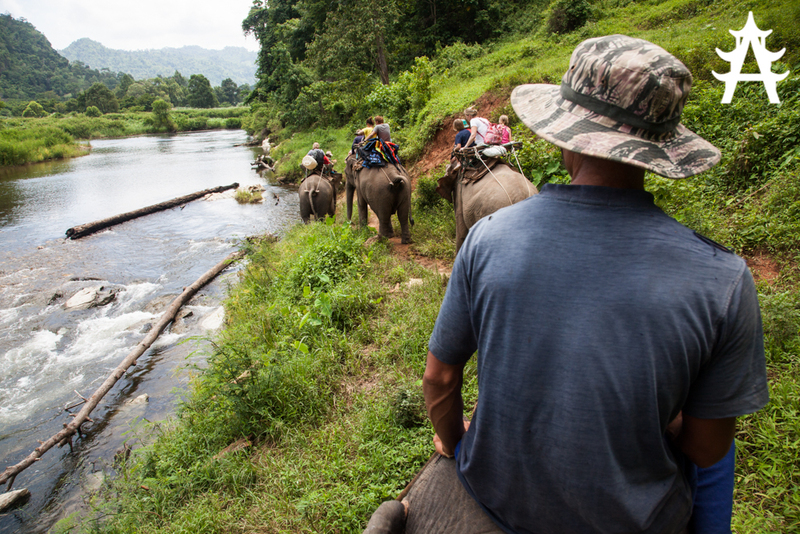 After this probably hour long rafting experience we arrived back at the place where we mounted the elephants, boarded the 4×4 again and made our way back to the guesthouse. The whole trip lasted 6 hours in the end (1 hour more than promised) and was well worth the money. I am still not a fan of package tours, but this one is definitely highly recommendable.